It’s obvious that a proper diet will improve many areas of your life and is beneficial to everybody, including athletes in particular. 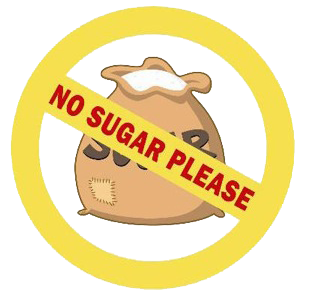 Because of the importance of quality nutrition, people should avoid excess sugar in their diet as much as possible. Anything that does not add to how you perform, whether in life or on the field of play, will, by definition, take away from your performance level. Natural sugar and fructose are two different types of sugar that can be used in both similar and different ways. Natural sugar’s main structure is sucrose, which can be processed into a variety of forms, from sugar to natural cane sugar juice. Fructose is the sugar found naturally in fruits which can be used as a sweetener when liquefied. In a comparison of the two, natural sugar is higher in calories than fructose. Fructose is also able to give you the perception of sweetness earlier than natural sugar, therefore requiring less fructose than natural sugar to get the equivalent flavor. Carbohydrates are the key source of energy when it comes to the nutrients in your diet, and they should take up about 45-65% of your daily calorie intake, according to the National Academy of Sports Medicine. Due to the fact that they are recommended to take up more than half your diet, it’s important that you put the best type of carbohydrates into your body. Vegetables, fruits, and grains contain complex carbohydrates, which not only give you a higher level of energy, but also a longer-lasting energy rather than the short spurt that sugar provides. Consuming excess sugar also depresses our immune system, making it more difficult for our bodies to fight off illness and infection. Some studies have shown that simple sugars, such as glucose, fructose, and honey, can cause your white blood cells’ ability to fight bad bacteria to be cut in half. These negative effects that eating or drinking too much sugar has on your immune system, takes effect less than half-an-hour after ingestion and can last for up to five hours. Sugar also influences behavior and the ability to focus properly from the effects of rapidly-fluctuating blood sugar levels, going from somewhat of a sugar high to a sugar crash in a relatively short period of time. There are many foods that we take in every day that are high in sugar. Some commonly-consumed high sugar items include soda, fruit juice, canned fruit, pastries, and candy. People often believe that drinking fruit juice is the same as eating fruit fresh off of the vine. The reality is that fruit juice contains basically the same amount of sugar as a soda while often containing none of the dietary fiber usually found in fresh fruits. There are many other high sugar foods, so it is recommended to make note of the sugar content of everything in your diet. Soda is a subject in and of itself, as Americans drink somewhere between an estimated 45 and 55 gallons of soda every year, which equates to a whole gallon, per person, every week. When you take into account that not everybody drinks soda, that number inflates even higher among soda-drinkers. As far as health impacts, studies have shown that the consumption of soda can contribute significantly to health problems including asthma, kidney issues, tooth decay, diabetes, heart disease, reproductive problems, osteoporosis, and obesity. Many people believe that drinking diet soda is a healthier alternative than regular soda because of its low calorie and sugar count, nothing could be further from the truth. While regular soda contains sugar, diet soda contains artificial sweeteners, something arguably worse. While these sweeteners are a low-calorie alternative to sugar, they are by no means healthier. The most widely used sweeteners in diet soda are aspartame, perhaps better known as NutraSweet, and sucralose. Every year, a majority of the adverse reaction reports made to the FDA stem from negative reactions to aspartame. Once aspartame enters the body, it breaks down into aspartic acid, phenylalanine, and methanol (wood alcohol poison). While diet soda contributes to several of the same health problems as regular soda, they are also known to cause others, including migraine headaches and gastrointestinal issues among others. There are more than enough reasons to avoid excess sugar in your diet, from avoiding health problems to an improvement in your overall life quality and performance. Overall, when it comes to performance, it’s best to limit any source of sugar. Sometimes, just being aware of what is in what we are eating will lead us to making better choices in our diets. 2 Responses to "Sugar’s Effect on Athletes & Avoiding High Sugar Foods"
Great information… guess ill pass on my morning donut!